When I moved from Maine to New Hampshire I wanted to get to know other local business owners in Mount Washington Valley. After dining at the Thompson House Eatery last year, I knew this was a place I wanted to photograph. When I emailed the general manager, Meghan Moody, about the opportunity, I had no idea I’d be walking away with not only new friends in the valley, but some of the most genuine people I’ve ever met. Jeff Fournier, Chef/Owner + Kate Fournier, Owner. When you dine at the T.H.E. you feel like family. This focus on family goes deeper than just the restaurant, as owners Kate and Jeff Fournier live on the other side of the wall. The stunning 1790’s farmhouse on 5 acres serves as a home for the Fourniers to raise their two sons in Mount Washington Valley. “It is truly a live, work, love venture and our family puts our whole hearts into creating an incredible restaurant where each patron feels like a welcome guest in our home,” Kate said. It’s easy to see and feel this as you dine in this wonderful place. Every member of the T.H.E. staff is there to make you feel right at home. Thompson House Eatery has been a landmark in the Jackson community for almost 40 years. When it closed, Kate and Jeff decided to keep its legacy going, just as the former owners hoped. Everything is made from scratch- pasta, bread, pastries and ice cream! Jeff, a nationally established chef, loves to work with local farmers like Pork Hill Farm and Mill Brook Farm to source pigs, lamb and beef for whole animal butchery. They grow their own microgreens, in house, year round. When I ate there for the first time, the mushroom risotto was made with mushrooms foraged that afternoon in the nearby woods. It doesn’t get much fresher than that! 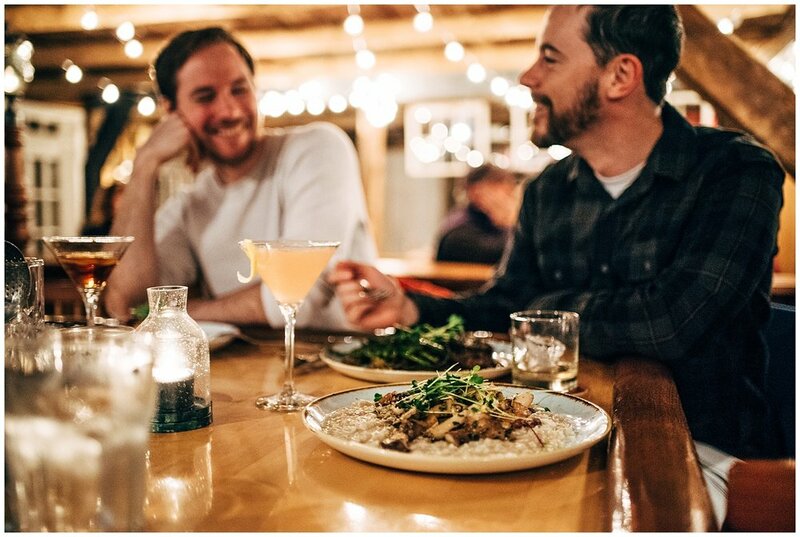 When you visit Jackson, New Hampshire, the Thompson House Eatery is a must. After a two week vacation, they will reopen on Wednesday May 9th and are also open for Mother’s Day this coming weekend. Call ahead or reserve online to grab a spot! Tommy J making a delicious cocktail! Daily family meal with the whole staff before the restaurant opens. I can’t say enough about this place - you just have to check it out for yourself. Thank you Kate and Jeff Fournier for letting me capture your restaurant and for the delicious food. Thank you Meghan for making this all happen and for the hospitality!